Knowing my aversion to restos but Rob’s appreciation of them, Rob and I have been slowly visiting vegan-friendly restaurants in Toronto. Our favourite raw restaurant has now been usurped. Raw Aura serves delicious food, but we seem to leave the resto filled to capacity with their rich meals. It is probably our fault – there is no need to order a starter and a main, here. Let alone a juice or dessert*, delicious as they all are. The dishes are heavily based on nuts, seeds and oils, which is why we always are stuffed afterwards. Our new favourite raw resto is Belmonte Raw. Closer to home, to boot; although their hours are terrible, only open for lunch. They’ve only recently opened up shop as an eat-in eatery and we couldn’t have been more pleased with our meals. The cozy place is a bit confusing, though. You pick your meal from the refrigerator case from stacks of take-away containers. You bring it to the cash and they will literally transform it into a beautiful meal. I honestly marveled at how much food came out of such a small container. In any case, I really enjoyed my raw burrito (and Rob, likewise, enjoyed his sunflower burger). My burrito was a huge collard wrap stuffed with jicama fries, sprouts with their nut meat (it may have been sunflower seed based but I forgot to ask). When I say stuffed, though, this was a great veggie-heavy wrap which is what I loved! The nut meat was a highlight, not the main part of the dish. Along with the wrap, there were dehydrated corn chips with salsa, guacamole and chipotle nut cheese. The nut cheese is uber smooth and scarily reminded me of cheeze whiz! Taste and colour. After eating the burrito, more jicama fries and a smoothie, we were both positively stuffed but in a good way, knowing that we ate primarily veggies and not heavier nuts/seeds/fats. Somehow we still managed to eat their delightful raw chocolate desserts. So smooth, with either a raspberry or peanut butter filling. Of course, I was itching to duplicate the meal at home. One of the main drawbacks of Belmonte Raw are the prices, which goes with a visit to most restos. I figured that if I spent the same amount of money on grocery produce, I could whip up quite a few burritos. This gave me enough incentive to close my eyes at the price when I bought some sprouts at Whole Foods. Thankfully the rest of the ingredients were much cheaper: my weekly raid through Sunny’s was where I picked up the bunch of collards ($1.59), lemon (4/$1), and jicama ($1.49/lb) – all at their regular prices. I have yet to see sprouts at Sunny’s and should really learn how to grow my own. Other than fresh veggies, my creativity lied with the cashew nacho cheese. I spiced it with red pepper paste, miso, nutritional yeast, lemon juice, sweet smoked paprika, garlic and onion for maximum flavour. (Chipotles in adobo sauce still scare me). It does not disappoint. 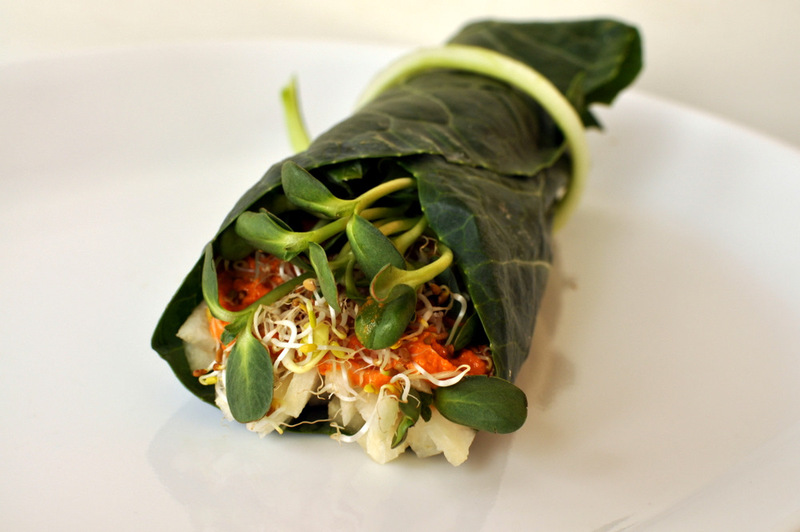 Use it as a fabulous dip, or spread into a “raw burrito” such as this one filled with julienned lemon-spiked jicama slices and mounds of sprouts (I used alfalfa and sunflower sprouts). My burrito was not as big as the one at Belmonte Raw. They needed a string to keep everything in place! I made smaller ones and used a sliver from the collard stem to keep them together for the photo. I would skip that entirely if eating right away – it was quite a tricky thing to tie! This is being submitted to this week’s Weekend Herb Blogging, hosted by Marta, to this week’s Healthy Vegan Friday, to this week’s potluck party for raw foods and to this week’s Weekend Wellness. 1. Julienne jicama and coat with lemon juice. Set aside until ready to wrap your roll. 2. 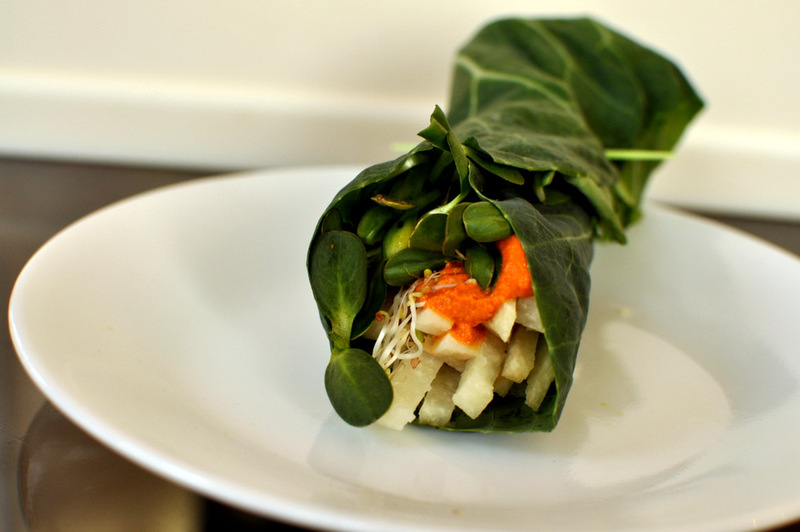 Remove stem from collard leaf and top with julienned jicama, nacho cashew spread and sprouts. Wrap and eat! Jicama fries are the best! I don’t know why I don’t eat it more. This cashew spread sounds great too. I’m loving miso in everything lately – it adds a delicious richness! The recipe sounds wonderful, especially the spread. Just don’t know about using sprouts—I’ve avoided them for years because of all the reports about contamination (even though I have never gotten sick from them nor have I known anyone personally who has). Janet, as a doctor, what are your thoughts on this? And as an accomplished recipe developer, any suggestions for what I could replace the sprouts with? Red bell peppers, perhaps, since there is a bit of them already in the spread? Or maybe some fruit? I’m typically not a fan of going out to eat, especially if I know I can create something equally delicious at home! 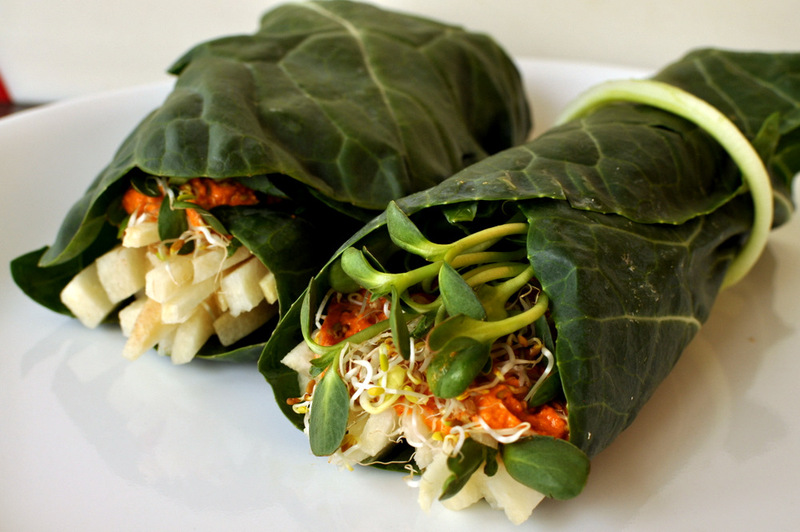 These wraps sound like they’re stuffed with deliciousness! And good healthy deliciousness, at that. That looks so enticing and such beautiful photos. These are just gorgeous!! You did an amazing job of recreating tese at home. That nacho cashew spread sounds so yummy. yumm. how i love a crunchy cheesy wrap! Oh, I am making this TODAY! The cheese sounds so delicious. And I love that there’s jicama in the wrap. Such a juicy crunch! Yum, yum, yum!! I can’t wait to try this, especially with the nacho cheese sauce!